Chicago is filled with fantastic architecture. Chicago offers a bountiful array of subject matter and from sunrise to late night activity, there is always something to shoot. Shot around 4am in the middle of downtown Chicago. The post office and Federal Courthouse are right on this square. 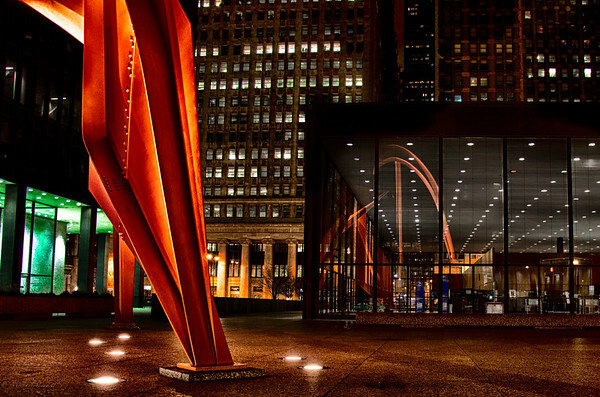 Alexander Calder created this orange sculpture and it's truly a sight to behold. Shooting on a Sunday morning at such an early time left me almost alone in the loop which is a crazy feeling when it's normally so populated. Shot on the morning of 12-8-13.